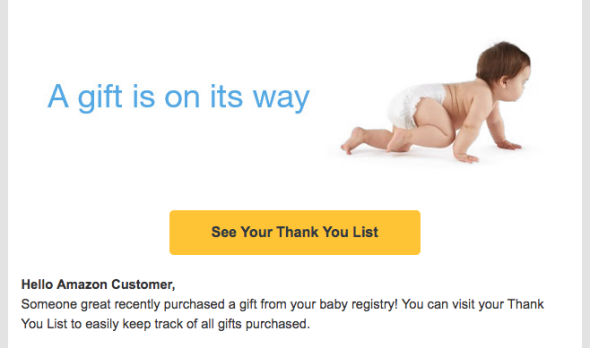 Amazon just sent a ton of people a weird email about their (nonexistent) baby registries. If you have an Amazon account, you might be freaking out right now. You just got an email congratulating you on a gift from your baby registry that recently shipped, but you don’t remember notifying Amazon of your pregnancy, choosing items for a registry, or conceiving a child in the first place. What does Amazon know that you don’t?! Don’t worry—you’re not secretly pregnant. (Unless you are, in which case: Mazel tov!) It looks like Amazon accidentally sent the same email to a lot of people, regardless of the occupancy status of their uterus. We’ve confirmed that both men and women got the email, so it’s not a sexist “Amazon sent a thing to all women because women love babies” thing. (One Slate colleague who got the email does in fact have his own baby registry, as he and his wife recently had a baby, so he assumed an actual gift was heading his way.) But a little unscientific polling of my friends and colleagues has revealed that the recipients are mostly women. What gives? I didn’t immediately think anything was off about this email because I purchased something off my friends’ Amazon baby registry earlier this week, and assumed this email meant it had shipped or something. It wasn’t until I saw Maria Konnikova’s tweet that I realized what had happened, and that I wasn’t the only one. What I’m saying is, I think Amazon accidentally sent possibly millions of people an email that was just meant for me. Sorry! More unscientific polling of my people reveals a significant but not exclusive correlation between getting the email and having purchased items off friends’ baby registries. And the link in the email goes to the general Amazon page used to set up baby registries. So here’s another theory: Amazon looked at users’ previous purchases, tagged those who’d bought baby things, figured that those users are in the time of life when and social circles where people are starting to have babies, and guessed that they might want to set up a registry sometime soon, too. Or maybe a baby just crawled across the Amazon master keyboard. It’s anyone’s guess! Update, Sept. 20, 2017: Amazon has issued the following statement on its weird baby email: “We are notifying affected customers. A technical glitch caused us to inadvertently send a gift alert e-mail earlier today. We apologize for any confusion this may have caused.” Cool.